Our two cyclists , Budgie Brewer (the Upton Rocket) and Adam Oakley (the Slade Flyer) have grasped the gauntlet and are all set to undertake what is for them a mammoth cycling trip through Wiltshire and Hampshire and across the water to the Isle of Wight. They will stay overnight in Freshwater and return the following day. Originally conceived by Budgie as he lay in the bath the trip will cover about 120 miles that will be pedaled and a few more via the ferry from Lymington. It is said that the outgoing trip is ‘downhill all of the way’ but unfortunately the lads have realized that the return trip will be uphill all of the way home. Both lads do a little cycling but this is an epic journey compared to a ride across the valley to the Cross Keys at Corsley! The boys are north of 55 and have a combined age of 120 which coincidentally is the same as the number of miles they are hoping to achieve. Adam and Budgie are passionate about the charities they are raising money for, the Village Hall is a masive asset to the community of Chapmanslade and Dorothy House provide essential care and support when it’s wanted most. To make an event like this happen it’s not about a couple of blokes on bikes. Behind this epic effort is an unrivaled focused support team. 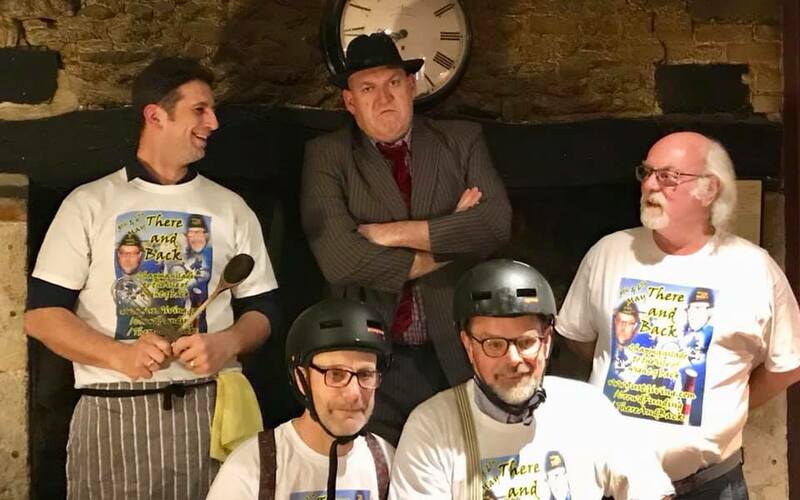 Training Venue Coordinator Ben Leveque (left), has generously allowed the team to use the Three Horseshoes pub as a training venue and communications hub. On Route Support Specialist Ken Davies (right) is using his specially adapted support vehicle to identify possible rest points on the route as well as providing essential encouragement (there’s a pint on the bar for you and if it hurts don’t sit on it!) to the riders as they push the limits of human endurance. The Agent Stevie McStevie (centre) has single handedly carried out all of the promotion as well as taking care of all of the funds. His positive influence keeps us all under control.